The Dark Elf Nation, standing against the tide of demons. The Dokkalfar were a surface dwelling fae race that possessed dark skin - although lighter than the drow - and vibrantly colored hair. They were the exiled southern tribes of the surface nation of elves, who fled underground during the end of the Moons Age War, settled, and eventually evolved into the current drow races. The dark elves no longer exist as a whole people, thought it can be presumed that many aspects of their civilization likely live on today in drow society, though the origins may have been forgotten. For the most part, the dark elves are considered extinct, as their Empire no longer exists; however, dark elves have recently been spotted in colonial establishments on the surface. 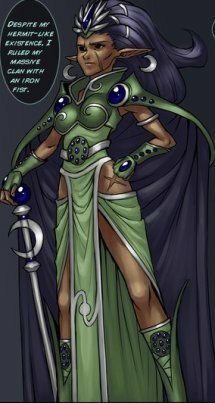 The Val'Sharess is one of the rare surviving dark elves of the Moons Age, which places her age at a thousand years old, at least. According to the generation system, she would be classified as a First Generation. Dark Elves are only depicted a few times in the comic, but appear on average to be of a largeer build in comparison to average Drow, reaching 2.25m tall or around 9' feet. Since Dark Elves are most likely a small racial step from Light Elves that developed traits to befit their surroundings, they may in many ways be similar to Light Elves in stature and shape. As a fae race (one of the three sentient base races left after the War of the Moons), they have aura and are proficient in some degree of magic, and the few left are typically very powerful magic users. 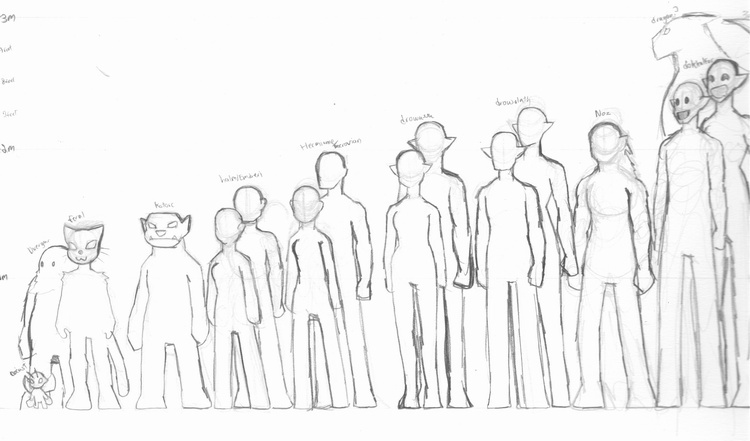 When in large groups with other Fae, they stop aging at adulthood and carry little in the way of body fat. Dokkalfar have skin tones that are various ranges of tanned, going not quite as dark as the Drow to as nearly light as Light Elf skin tones. This may be because they lived in southern, equatorial lands (or a southern, equatorial continent) and therefore have adapted to a warmer climate by retaining darker skin tones, as unlike their brethren in northern lands with cooler climate and harsher winters they probably did not require large amounts of clothes, which allowed a greater production of and base amount of melanin. Dark elf hair and eye colors are often darker, though they cover nearly all ranges of violet, blue, black, brown, and green, with the incredibly rare colors of red and blonde possibly showing up from time to time. Their eyes also lack the red pupils found in drow. Dark Elf life spans were similar to Drow when it comes to living in fae societies. It is unknown if the age of maturity were similar to that of Drow, nor the rate of maturing, as Dark Elves gave birth to Drow in the Underworld. Dark Elves immediately evolved into Drow in the first generation of children born in the Underworld. Dark Elves are also referred to as First Generation, and the Drow hierarchy/age system is based upon how close a drow is to Dark Elf blood based upon their maternal side. While most of the original Second Generation drow have many Dark Elf traits, subsequent generations vary due to how bloodline traces from the mother with no care of the effects of a later generation male on the appearance of the children. This segues into the fact that Drow and Dark Elves can have children, though the children will ultimately always be Drow in the Underworld, and as time passes least likely to appear like the first Second Generation. 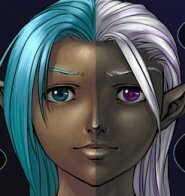 Dark Elves also can have children with any fae race that it is physically possible to mate with, though it is unknown exactly what traits will manifest in the offspring of such unions (other than the one with Drow mentioned above). Dark Elves were independent, though more orderly than Drow. They came together for racial identification as well as religious purposes (Moon worship). They were strong willed, and the strongest survived the War of the Moons and the Ashes Age, making their way into the Underworld and creating settlements. However, they were not adapted to such surroundings, being used to sun and moonlight, open air, weather, seasonal changes, and a different diversity of flora and fauna. The Underworld slowly became a prison to many, and when the Drow rose up and cast down most of the Dark Elves, the remainder slowly faded away, leaving society and in many cases killing themselves with the realization that they would never see the surface world again. Many were killed due to Drow prejudice, possibly seen as no better than Light Elves. The few that remain alive are very powerful at magic and negotiations, as well as the strongest of will and possessing a strong survival trait. They have made themselves indispensable to the clans that shelter them or simply too daunting or level-headed to remove from positions of power. Diva’ratrika’s mother, first Ilharess of the Val’Sharen Clan, was able to forge her clan by being a harsh mistress with an eye on every member. The civilization that Dark Elves brought about was quite a strong one, not one to be trifled with easily. It covered most of the southern lands/southern continent and magic filled nearly every aspect of life. Higher ranked dark elves appeared to have a very luxurious lifestyle, whether male or female, and clothing worn was often for comfort in warmer climates, and therefore tended to be rather revealing. Such a convention may be why Drow dress in revealing manners at times, using gossamer and other slightly transparent fabrics. It is unknown if they started the convention of covering the neck or if it came later after the Drow violently rose to power. Dark Elves are quite comfortable with their bodies and appeared to have some degree of bisexuality, though probably not quite as prevalent as in Drow society. Dark elf dwellings seemed to incorporate trees and natural elements already existing in an area, which shows they too had some natural leanings like their Light Elf cousins. It is unknown what relation they had to fledgling human tribes or societies, though the way Drow look upon humans over other enslaved surface races may show an old preference that the Dark Elves had in their neighbors. Similar to Drow society, there were nine major clans, one which revered its own moon. Each was ruled by a queen, though Ilharess is a newer Drow term. While magic usage was greatly preferred by the Dark Elves over the more martial weaponry and fighting styles of the Light Elves, the kingdom of the Dark Elves was very strong in the military arena, and those who lead war efforts tended to use any means for victory. When war finally broke out between them and the equally strong Light Elves for reasons forgotten by any Drow, it was a devastating affair, especially when the Dark Elf preference for magic entered into the equation and the Light Elves’ attempt to match it. Dark Elves were highly adept at the Mana Arts, especially the art of summoning, known as Elendlar, which pulls the aura of a fae creature out of its body and seals it for use later in battle. It was an art meant for higher-ranking females and was considered quite sacred, and eventually the practice spilled over into the Light Elf culture, though to a lesser extent. Over time, summoners found out how to open gates to other dimensions and bring for more powerful summons, referred to as “demons”, creating the art of Velnar, or demonic summoning. Velnar grew in usage during the War of the Moons, and soon summoners on both sides were opening gates into other worlds that they could not control. This inevitably led to the end of both the expansive Light Elf and Dark Elf empires and the devastation of many species of fae, leaving only the struggling remnants of these two kingdoms and the elusive Faeries. As Dark Elves moved underground, Sharess, one of the great queens, was able to mimic the demons that had come into the world and separated her aura from her body, allowing her to pass into the demonic realm that was keeping the gates open and possessing a demon there. She then closed the gates, ending the widespread destruction and cutting off access to that dimension. Because of this, Dark Elves left most of their moon worship behind and focused it on their departed leader, who if still alive was vigilant in defending them from other realms. Due to the practice of combining of fallen elves with creatures infused with mana during the times after the War, certain creatures became connected to Sharess and given sacred status or at least were revered in other ways by the forming clans. These were mostly spiders, especially Awares and Driders, and dragons, which are fae creations along the lines of the Awares and Driders. Some of their older fortresses and settlements have appearances like these creatures and doorways similar to things lost on the surface, such as trees and various landscapes. Dokkalfar were already giving birth to Drow when Chel’el’sussoloth and other major underground cities were forming. A few different clans came about, ruled by Dark Elves or second generation Drow, including the Val’Sharen (now Vel'Sharen) and the Val'Sullisin'rune. These clans began with iron-fist rulers that took great care in setting up hierarchy and maintaining loyalty among their flock, leading decisively and showing little mercy to assassins and spies, while in other clans infighting began to increase as a number of Drow members came into their own power and resented the rule of the Dark Elves. Approximately two hundred and ten years after the exile of the Dark elves and just under a hundred years after the formation of Chel’el’sussoloth, war broke out as the Drow finally hit their limit of allowing the fading Dark Elves to control them, as well as how the hierarchy of clans was set up. It lasted a quarter of a century or more, with the Drow victorious and many of the remaining Dark Elves killed or pushed into exile under the rule of their children. As the Val’Sharen clan gained the foothold to be the ruling clan of the city, their leader took the throne of Queen of Chel’el’sussoloth and was given the title of Val’Sharess. Her daughter, Val'Sharess Diva’ratrika Val’Sharen, succeeded her to the throne some time later. The rule strengthened the Sharess religion on Drow culture, which would last about six hundred years until various surface-bound groups and nether cults started to come into being, questioning such beliefs. While Dark Elves of the Moons Age are among the older clans, they are mostly dead as a race and a culture. What is left of their ways lives on in various random social practices of the Drow, as well as the long-running taboo of demon summoning and the view of Tainted as being weak, disgusting, or handicapped. 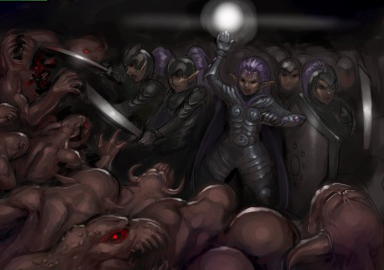 With recent efforts to colonize the surface, clans with the means to survive on in the Overworld have begun to see a population increase of dark elves. It was discovered by early colonists that one could reverse the effects of the Mists and give birth to healthy dark elves once again. Nations like Nuqrah'shareh and Mimaneid, who took advantage of surface recolonization early, began seeing dark elves in their population much sooner than nations like Chel'el'Sussoloth who shied away from such efforts. As they are generally a rare sight, there may still be lingering animosity towards colony-born children from the memories of those who suffered under Dokkalfar oppression. However, without the child being raised in the presence of clans with intact practices and customs of the past, she would never be as her ancestors of the grand Moons Age were. Colony-born Dark elven children grow up with a Drow mindset and having Drow values.